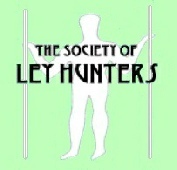 The term ley (or ley line, as is often used) was originally coined by Alfred Watkins of Hereford in the 1920s to describe his perceived straight alignments of ancient sites across country. Such sites included prehistoric standing stones and stone circles, barrows and mounds, hill forts and earthworks, ancient moats, old pre-Reformation churches, old cross-roads, river crossings, fragments of old straight trackways, and prominent hill tops. A detailed exposition of his ideas on leys and landscape alignments can be found in The old straight track by Alfred Watkins. The word "ley" is also a Saxon word meaning "cleared strip of ground" or "meadow". A close examination of Watkins' leys reveals that he was perceiving a number of different kinds of alignment. A small number were simple alignments of prehistoric sites, but many were what we would now call "church lines" (a phenomenon fully accepted by German archaeologists), "corpse ways", "church paths" and "coffin lines" It is clear from his writings that Watkins also included straight Native American paths or "roads" too. The term "ley" is therefore a generic term for archaic linear features of all kinds. These lines appear in many different cultures and periods and manifest themselves in varying forms. Ultimately they and other linear features, lore and traditional concepts can be found to have a "spirit" element of some kind - often spirits of the dead.